From Valmont China Co Japan is their Royal Wheat Pattern China. 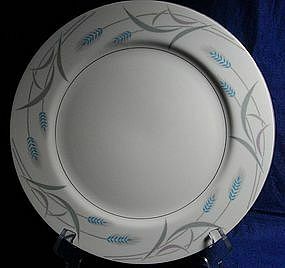 Blue wheat with rose and grey leaves, platinum trim. I have the following pieces available: 1 Large serving platter 1 medium serving platter 7 plates 1 large vegetable bowl 1 medium vegetable bowl 6 dessert plates 6 saucers 6 cups 4 small bowls Cream and sugar set Please e-mail for complete description and pricing. We can work out a great deal!